Asia’s leading health and beauty retailer today revealed ‘Raya Ni Mesti Cun’ music video to kick start its Hari Raya campaign with a star studded casts of more than 20 top Malaysian personalities. “Hari Raya is one of our most important festive season to continuously engage with our customers. 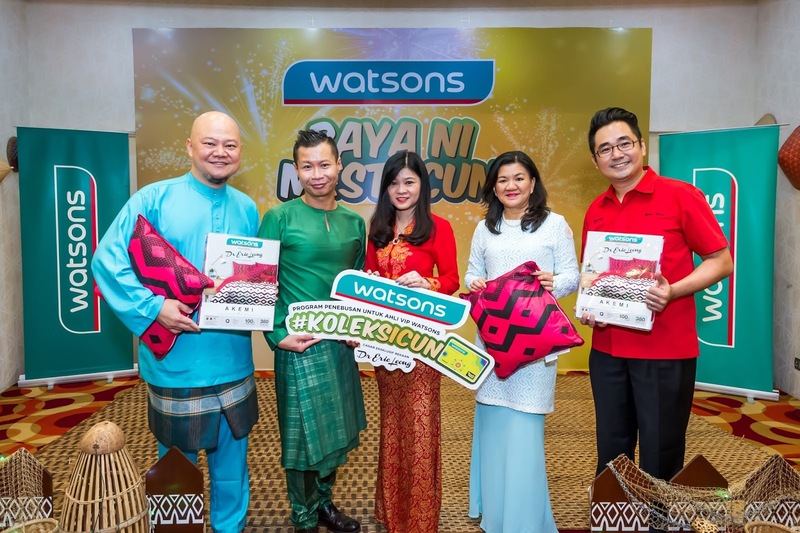 Aside from the innovation of products available at our stores during this festive season, this year we are sending across the message of preparing oneself to be ‘cun’ to celebrate this special occasion,” said Danny Hoh, Head of Marketing, Watsons Malaysia to the media. The music video is anchored by top Malaysian actresses including Mawar Rashid, Sari Yanti and Raja Ilya where each of them helm a character namely Limah Skemah, Kiah Selfie and Siti Tudung in the music video which later undergo transformation in Watsons to become 3 beautiful young ladies. The music video was co-directed and produced by Urban Ads together with Watsons marketing team. The shooting of the music video took place in April 2016 in Klang Valley. To showcase diversity in the music video, Watsons also invited top Malaysian personalities of various races for cameo appearances in the music video. The celebrities’ line-up includes Amber Chia, Arja Lee, Dayah Bakar, Kit Mah, Monika Sta Maria, Nadia Heng, Nadine Ann Thomas, Nomad, Shuk SYJ and Wafa de Korte. “We continued on with the successful formula for the last Chinese New Year music video, which became one of the most watched music video in Malaysia this year. And with the same anticipation, and even with bigger cast, we bring this music video to showcase the importance of being beautiful inside and out to celebrate Hari Raya,” added Danny. A limited edition cushion and bedsheet designed by Dr Eric Leong in collaboration with Akemi. This limited edition master piece design is available at all Watsons store during the redemption period from 16 June – 31 August. For every RM20 spend at Watsons store and Online, a customer receives one e-stamp. And extra e-stamp is given when spending on Watsons brand and participating brands during this campaign period. The limited edition cushion and bedsheet is made available with five e-stamp and purchase of RM14.90 onwards. The #KoleksiCun is also an opportunity to give back to those in needs as for every bed sheet redeemed, Watsons Malaysia will donate a blanket to the homeless via Kechara Soup Kitchen Society. This Hari Raya promise to be exciting as Watsons presents Jualan Hebat sehingga 50% at all Watsons store nationwide beginning 16 June (West Malaysia) and 23 June (East Malaysia). Tech savvy users can also look forward to the all-new Watsons Malaysia Mobile App which is available on Google Play Store & Apple App Store which also offers attractive promotion during Hari Raya. This festive season, Watsons VIP members that spend a minimum RM100 using the Watsons Touch ‘n Go card in a single receipt, they will get to enjoy RM5 rebate. This promotion is valid for the first 10,000 members only.